The Team System menu lets you create a new work item, or put the image on an exiting work item. The "New Work Item" dialog has a "Do not display this dialog again", wish all dialogs had that option. 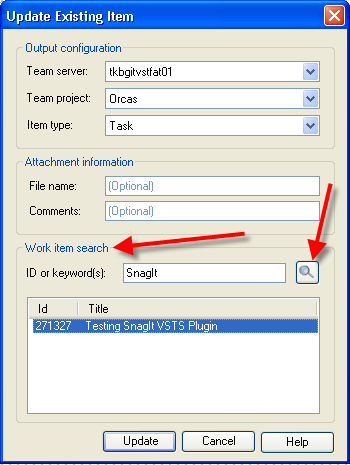 I learned that you must be running SnagIt v8.3 to enable these Output plugins. I was running v8.2 and needed to upgrade. Brian Harry posted about it too. BTW, their new ScreenCast.com site is cool, wish they had a community account, something cheep I could afford (~$30/yr). I heard TechSmith uses Team System internally, rock on. Hi; you actually need version 8.2.3; there is no 8.3. 8.2.0 didn’t work well with .Net-based accessories, so that’s why you need the most recent one. I work for TechSmith, and saw your post so I thought I’d chime in 😉 Glad you like the accessory! And you’re right- all of our development teams are using Team System and it’s working out pretty darn well for us.